When most people look at the Buffalo Bills quarterback situation, they probably say "what a mess." 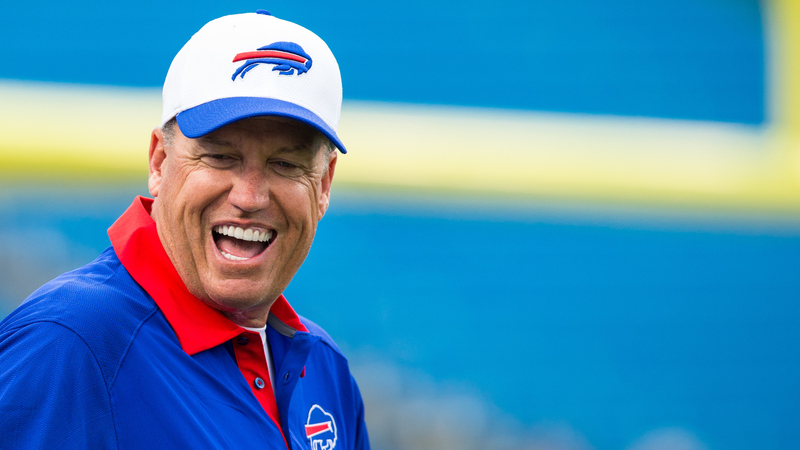 When Bills head coach Rex Ryan looks at it, he smiles. Ryan has three quarterbacks on his hands vying for the starting job, with none of the three making his decision particularly easy. That doesn’t seem to bother Ryan in the slightest bit — in fact, he likes the situation he’s in. "This was the scenario I wanted," he said, per the team’s transcript via NFL.com. "I wanted a scenario where all three guys performed at a high level and I think we have. When you look at the games that I think all three guys have performed at a really high level, and so that’s what exactly I was wanting. If I was a betting man going in to it would I have said that? I’m not sure. But I’m glad it’s working out the way it is." In Ryan’s defense, Matt Cassel, Tyrod Taylor, and EJ Manuel all have played relatively well. Both Manuel and Taylor were sharp in the last preseason game, leading the Bills to a comeback victory. However, that doesn’t mean the Bills will have a great player at quarterback when the regular season starts. And we probably won’t know who that is until Week 1. Ryan’s not a fan of revealing his starting quarterbacks before it’s necessary. He won’t even do so for the team’s next preseason game. "I think you guys overblow that one," he said. "They’re preseason games. You know, super important and all that, and maybe to some teams it is. To us, the preparation, we just want to get it right come the opener." Ryan has told the media several times that he won’t name a starter until Week 1, citing "competitive reasons." He’s yet to budge on that notion, and it’s easy to see why: He loves the quarterback situation right now.